1) Tony brought in a platter of sandwiches from ye Sybwyye for lunch, God bless him, and then I closed my eyes for a time, but did not sleep. I don't know why. 2) Early in the afternoon the grownups went to the cemetery, and I was able to see the headstone in place for the first time. The four of us stood around - as one does, I guess, when visiting a grave - remembering what it was like this time last year with Daddy, and things about him from before his decline: his laughter, especially, but also his devotion to his own parents. An excessively sunny day to visit a cemetery, and a soggy cemetery at that. 3) Conveniently, Hokus Pokus (the preferred liquor store) was just a hop and skip down the road, and Tony and I each stopped in for a needful potation: vermouth, in my case. I laughed like a drain seeing "Spiritual Advisors" across the top of their sign! 4) And then homeward, and to work on a carrot casserole. Laura put in Frosty the Snowman, clearly tickled to be sharing it with me since she and I grew up sharing all those Christmas specials together. 5) The casserole was a bit of a fail, for reasons too tedious to go into. Mother, because she is an expert, was able to salvage it after her well-deserved nap. 6) These days we open our presents before Christmas dinner on Christmas Eve - that was the tradition in Daddy's family, and besides Laura's family goes off to her in-laws on Christmas Day anyway - and when it is time for presents it is time for presents and let's not let anything interfere with it! Today's For Better or For Worse kind of sums up my attitude. So we got derailed almost at the beginning because of a lamp that had been moved with the best of intentions and do we move it back or not, or can other lights in other places provide sufficient light for that one chair by where the lamp was moved, and on and on and on and on. And I'm standing there restraining myself from saying "CAN WE PLEASE HAVE THE PRESENTS NOW?! BECAUSE IT IS TIME FOR THE PRESENTS!" 7) All six of the Tylers claimed all the sofa space, leaving me isolated in the chair closest to the tree, which made me Santa. And there were many amusing moments. 8) I was delighted to receive dishtowels with Louisiana motifs, an Alice in Wonderland tarot deck, a daily calendar of Shakespearean insults, and a box of notecards featuring photos of succulent plants. This led me to point out that the irony that I was receiving stationery in a year that I was not giving any, which led the children to applaud. 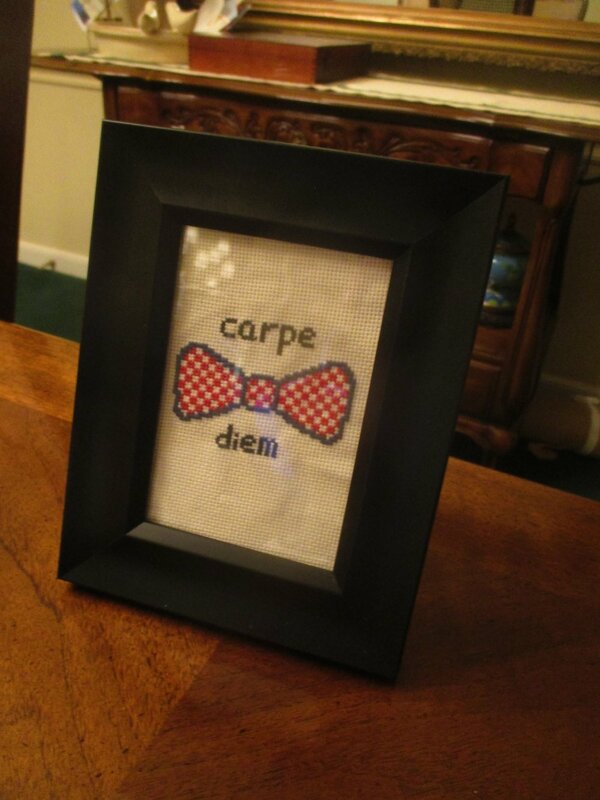 8a) Best of all was a gift from my nephew's wife: a needlepoint she made herself for me with a bowtie and the legend "Carpe diem." I am going to bring it to the office. 9) Often the distribution of envelopes comes at the end of our Christmas, and this year the visible envelopes for Santa to distribute were from my nephew's wife. The note she wrote in mine was enormously sweet and I almost got verklempt. 9a) All this prompted Mother to trot to the other end of the house to return with her own envelopes, which was very nice. 10) File the resulting confusion of serving the dinner under Too Many Cooks. At least I can ham my way through the blessing without making a fool of myself. 10a) My brother-in-law is one of those people who likes to be the last one through the buffet, so it amused me to tell him that my latest column is on that very topic. And he was all set until I got called to take care of something, and I was the last one through anyway. So we had a good laugh over that. 11) Sitting in Daddy's seat at the head of the table, I recognized that the Tylers were all sitting in their usual places, and my old place in the center on the left side is now taken by my nephew's wife. That family all has a great rapport with each other, complete with their own jokes and references and they all know; they are not just family, but friendly with one another. 11a) They all looked lovely from where I was sitting. I wish I could show you, but that family is notorious for not liking to be photographed, and I gave up long ago. 13) By now the family has frittered away to bed, here or elsewhere, and I am the last holdout, continuing on this entry after a long phone chat with my best friend. I don't know that I can call this a merry Christmas, in spite of the laughter. But it has been a good Christmas, and I'm very grateful for that.